Nov. 2, 2001. Working on a plate (12 X 18 in.) of some white trillium growing in the woods. 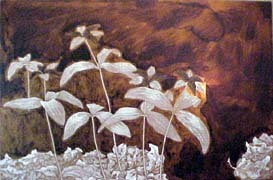 There are a zillion different kinds of trillium, which look very different and are found in different places. This is a type which occurs around where I live. This is the drawing, on tracing paper, whose lines get transferred to the plate. This one uses a thin layer of soft ground on the plate, with the drawing laid face down on the soft ground and the lines retraced with a pencil, which presses into the soft ground and makes lines in it which are then etched into the copper when the plate is immersed in ferric chloride. This gives a soft line similar to a pencil on paper. I'll use etched lines needled through hard ground for the flower petals, to help accentuate them. Next step, Aquatints!! Dec. 19. Christmas rush. Orders to fill. Platework ends up on the back burner. Anyway, this is a picture of the first line proof, printed from the plate before the aquatints get etched. 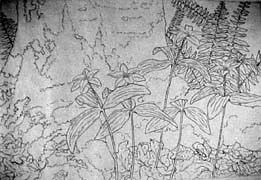 For this image I plan to use a fine aquatint for the foreground, medium for the middle ground, and coarse for the background. The lines look about right so on to the fine aquatint. The flowers, plants and dry leaves have been painted with a permeable stopout (the white stuff) which gives a painterly looking result. I only wanted some very light tones on the blossoms, so I put the plate into the ferric chloride for 18 seconds, which will give me about a 10% tone on all exposed areas. (per centages refer to tones on a grayscale, 10% is light gray and 100% is black) The blossoms were then stopped out with asphaltum, more white stopout applied to the rest of it, and now it's ready to put back in the ferric chloride for an additional 17 seconds which will make a total of 35 seconds in the ferric chloride which will etch all exposed areas to about a 20% tone. 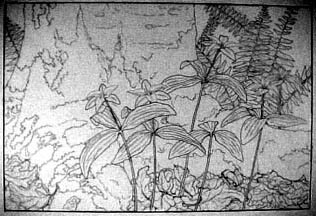 I'll then stop out all the plants, since I don't want any tones darker than 20% on them, and repeat the "step biting" process in the leaves for tones of 30%, 60% and 80%. Then I'll clean everything off down to bare copper and repeat the whole process for the middle ground imagery, then do it again for the background. This will give the image more depth and more impact than if I used one aquatint for the whole image.